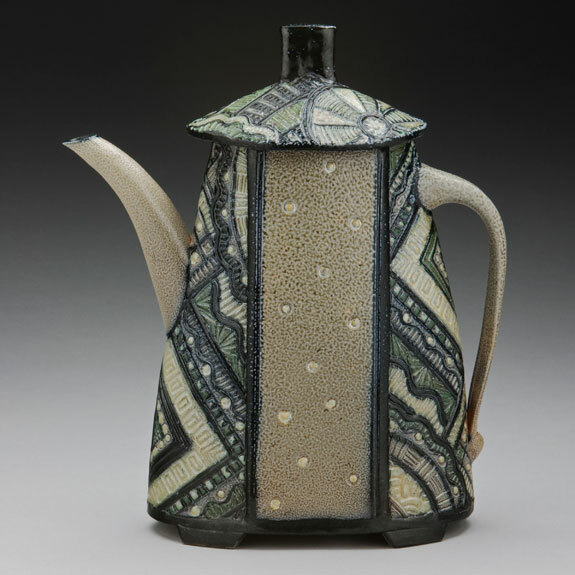 Previously textured tapered sections were joined with plain clay rectangles to form the body of this large teapot. An oval bottom was applied to the conic body form, defining the final shape. A clay slab oval matching the top opening was cut, and was trimmed to 1/2″ width to finish the top edge. A lid was formed from two pieces of textured clay, applied to an oval collar that fits into the top opening, and feet were added. After bisque firing, the piece was painted with slips and fired in a a salt kiln to Cone 10. $$225.00. 14″ tall, sold, special orders accepted for this form.